Very creative- really amazed by this company that comes out with such creative version. Spongebob is yellow in colour, so the mooncake is also in yellow colour. It is known as the fruities candies crust- using a combination of white lotus paste, cranberries, dry grape, chewy gummies and mashmallows. 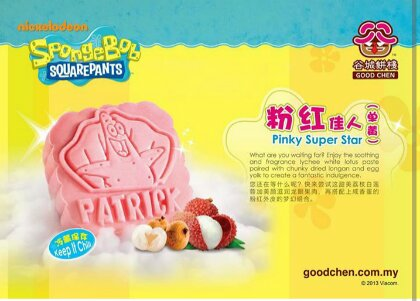 Another variety from the Spongebob Squarepants series is Patrick- in pink. The flavour used is lycee white lotus paste with chunky dried longan and egg yolk. 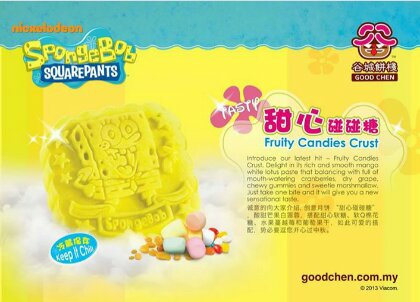 There are also other flavours from the Spongebob series- which you can obtain more information from their Facebook page https://www.facebook.com/GoodChenMooncake. 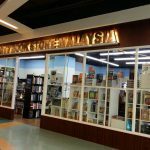 Good news for our dear customer, Our online purchase service is launch now. Step 1: Choose your mooncakes and gift set (at least 3 sets).